For other Scottish queens and princesses called Margaret, see Margaret of Scotland (disambiguation). Margaret (Norwegian: Margrete, Margareta; March/April 1283 – 26 September 1290), known as the Maid of Norway, was the queen-designate of Scotland from 1286 until her death. She was the daughter of King Eric II of Norway and Margaret of Scotland. By the end of the reign of her maternal grandfather, King Alexander III of Scotland, she was his only surviving descendant and recognized heir presumptive. Alexander III died in 1286, his posthumous child was stillborn, and Margaret inherited the crown. Due to her young age, she remained in Norway rather than going to Scotland. Her father and the Scottish leaders negotiated her marriage to Edward of Caernarfon, son of King Edward I of England. She was finally sent to the British Isles in September 1290, but died in Orkney, sparking off the succession dispute between thirteen competitors for the crown of Scotland. Alexander, brother of Margaret's mother and the last surviving child of the King of Scotland, died on 28 January 1284. The Maid was left as the only living descendant of Alexander III. The King did not wait to discover whether his son's widow, Margaret of Flanders, was pregnant. Already on 5 February he had all thirteen earls, twenty-four barons, and three clan chiefs come to Scone and swear to recognize his granddaughter as his successor if he died leaving neither son nor daughter and if no posthumous child was born to his son. By April it had presumably become clear that the young Alexander's widow was not expecting a child and that Margaret was the heir presumptive. Alexander III's wife, another Margaret, sister of King Edward I of England, had died in 1275, and the oath he exacted strongly implied that he now intended to remarry. When Edward expressed his condolence to Alexander III that month for the death of his son, the latter responded that "much good may come to pass yet through your kinswoman, the daughter of your niece ... who is now our heir presumptive", suggesting that the two kings may have already been discussing a suitable marriage for Margaret. Alexander and his magnates may have hoped for an English match. The King took a new wife, Yolanda of Dreux, on 14 October 1285, hoping to father another child. On the evening of 18 March 1286, he set out to meet with Queen Yolanda, only to be found dead with a broken neck the next day. Following the unexpected death of King Alexander, Scottish magnates gathered to discuss the future of the kingdom. They swore to preserve the throne for the right heir and chose six regents, known as guardians of Scotland, to govern the country. Although the succession had been laid out by the time King Alexander III died, Margaret's accession was not yet assured. Her stepgrandmother Queen Yolanda was pregnant and the child was expected to succeed to the throne. There was a dispute in parliament in April involving Robert Bruce, 5th Lord of Annandale, and John Balliol, Lord of Galloway. Bruce may have opposed the Maid's succession, or the two men may have both claimed to be next in line to the throne after Yolande's child and Margaret. Yolande delivered a stillborn child in November, and within a few months Eric's most prominent councilor, Bjarne Erlingsson, arrived in Scotland to claim the kingdom for Margaret. Bruce raised a rebellion with his son, Robert, Earl of Carrick, but was defeated in early 1287. The precariousness of the situation made King Eric reluctant to see his three-year-old daughter leave Norway for Scotland. In May 1289, Eric II sent envoys, certainly not the first, to Edward I to discuss the future of Margaret, whom he called "lady and queen". Edward was later approached by William Fraser, Bishop of St Andrews and one of the guardians of Scotland, but the Scots could merely observe the negotiations between the two kings. Eric was indebted to Edward, and Edward was determined to make the most of the situation. The guardians, accompanied by Bruce, finally met with English and Norwegian envoys in Salisbury in October. The Treaty of Salisbury was drawn up on 6 November, stating that Eric and Margaret, "queen and heir of the kingdom", asked Edward to intervene on behalf of his grandniece so "that she could ordain and enjoy therein as other kings do in their kingdoms". Margaret was to be sent, by 1 November 1290, to England directly or via Scotland. Once the Scots could assure Edward that Scotland was peaceful and safe, he would send her to them. Edward was given the right to choose her husband, while her father could veto the choice. A papal bull sought earlier by Edward I was issued on 16 November 1289, permitting Margaret to marry his son, Edward of Caernarfon. The guardians and other prelates and magnates wrote that they were firmly in favour of the English match for "the lady Margaret queen of Scotland, our lady". It was strongly implied that Margaret's husband would be king, and Edward insisted on referring to Margaret as queen in order to speed up the accession of his own son, though the Scots themselves normally described her only as their lady. Negotiations about Margaret's marriage, dower, succession, and the nature of the intended personal union between England and Scotland continued into 1290. A lavishly provisioned ship failed to fetch the Maid in May because of diplomatic difficulties. The Treaty of Birgham, agreed on 18 July, provided that Scotland was to remain fully independent despite the personal union and that Margaret alone would be inaugurated as monarch at Scone. By late August 1290, Margaret was preparing to sail from Bergen to the island of Great Britain or was already at sea. The ship was her father's but he did not accompany her; the most prominent men in her entourage were Bishop Narve and Baron Tore Haakonsson. She must have embarked in good health, but became ill during her journey. The ship landed in Orkney, a Norwegian island off the coast of Scotland, on about 23 September. Suffering on the island for up to a week from food poisoning or, less likely, motion sickness, Margaret died between 26 and 29 September 1290 in the arms of Bishop Narve. Her body was returned to Bergen, where King Eric insisted on having the coffin opened to confirm his daughter's identity. He then had it buried in the north wall of the chancel of Christ Church, now destroyed. Margaret was the last of the line of King William the Lion. Thirteen men laid claim to succession, most notably Bruce and Balliol. Eric half-heartedly claimed the Scottish crown as well, and died in 1299. In 1300, a German woman came with her husband from Lübeck to Bergen, insisting that she was the Maid of Norway and that she had been sold by Tore Haakonsson's wife Ingeborg. The woman, known as false Margaret, was 20 years older than Margaret would have been, and was burnt at the stake for treason in Nordnes in 1301. She may have been used by Audun Hugleiksson as a pawn in the plot against the Maid's uncle, Haakon V, who had succeeded Eric II. Historians debate whether Margaret should be considered a queen and included in the list of Scottish monarchs. She was never inaugurated, and her contemporaries in Scotland described her as queen very rarely, referring to her instead as their "lady". She was called Scotland's "lady", "heir", or "lady and heir" during the deliberations of the Great Cause after her death. On the other hand, documents issued from late 1286 no longer refer to the "king whosoever he may be", indicating that the throne may have been regarded as already occupied by Margaret. Pope Nicholas IV considered Margaret to be the monarch of Scotland and treated her as such, sending to her a bull regarding the episcopal election of Matthew the Scot. In modern historiography she is nearly unanimously called "queen", and reference books give 19 March 1286, the date of Alexander III's death, as the start of her reign. Margaret's family ties resulted from the marital diplomacy that sought to ensure peace among the three kingdoms on the North Sea – Norway, Scotland, and England, and placed her at the centre of the Scottish succession intrigues. ^ Eric II was survived by one child from his second marriage, a daughter named Ingeborg, but was succeeded by his brother, Haakon V. When Haakon V died, he was not succeeded by his daughter Ingeborg but by her son Magnus VII. ^ a b c d e Oram 2002, p. 107. ^ a b Duncan 2002, p. 166. ^ a b c Duncan 2002, p. 169. ^ a b Duncan 2002, p. 170. ^ Duncan 2002, p. 211. ^ a b Duncan 2002, p. 171. ^ Duncan 2002, p. 175. ^ a b Duncan 2002, p. 178. ^ Reid 1982, p. 76. ^ Helle 1990, p. 149. ^ a b Duncan 2002, p. 179. ^ Prestwich 1998, p. 360. ^ Duncan 2002, p. 180. ^ Duncan 2002, p. 182. ^ a b Duncan 2002, p. 183. ^ a b c Duncan 2002, p. 181. ^ Prestwich 1998, p. 361. ^ a b Reid 1982, p. 79. ^ Barrow 1990, p. 135. ^ Duncan 2002, p. 194. ^ Helle 1990, p. 151. ^ a b c Duncan 2002, p. 195. ^ Reid 1990, p. 151. ^ a b Reid 1990, p. 156. ^ Prestwich 1998, p. 382. ^ Reid 1990, p. 152. ^ Reid 1990, p. 155. ^ Oram 2002, p. 168, 171, 347. Duncan, Archibald Alexander McBeth (2002). The Kingship of the Scots, 842-1292: Succession and Independence. Edinburgh University Press. ISBN 0748616268. Helle, Knut (1990). Norwegian Foreign Policy and the Maid of Norway. The Scottish Historical Review. 69. Edinburgh University Press. pp. 142–156. Oram, Richard (2002). The Canmores: Kings & Queens of the Scots, 1040-1290. Tempus. ISBN 0752423258. Prestwich, Michael (1988). 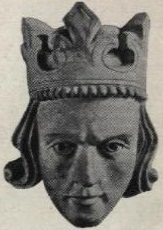 Edward I. University of California Press. ISBN 0520062663. Reid, Norman H. (1982). Margaret, 'Maid of Norway' and Scottish Queenship (PDF). Reading Medieval Studies. 8. University of Reading. pp. 75–96. Edward I, also known as Edward Longshanks and the Hammer of the Scots, was King of England from 1272 to 1307. Before his accession to the throne, he was commonly referred to as The Lord Edward. The first son of Henry III, Edward was involved early in the political intrigues of his father's reign, which included an outright rebellion by the English barons. In 1259, he briefly sided with a baronial reform movement, supporting the Provisions of Oxford. After reconciliation with his father, however, he remained loyal throughout the subsequent armed conflict, known as the Second Barons' War. After the Battle of Lewes, Edward was hostage to the rebellious barons, but escaped after a few months and joined the fight against Simon de Montfort. Montfort was defeated at the Battle of Evesham in 1265, and within two years the rebellion was extinguished. With England pacified, Edward joined the Ninth Crusade to the Holy Land. The crusade accomplished little, and Edward was on his way home in 1272 when he was informed that his father had died. Making a slow return, he reached England in 1274 and was crowned at Westminster Abbey on 19 August.